This article is about the real person. For the Futurama character, see Mark Mothersbaugh (character). 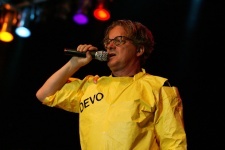 Mark Mothersbaugh is an American composer, musician, painter and singer. He is the co-founder and the lead-singer of Devo since 1972. He also does work for movies, TV shows and video games. He appeared as a mutated version of himself in the Season 6 episode "The Mutants Are Revolting". This page was last edited on 11 August 2013, at 22:18.